As long as the electricity for the circulation pump is acquired from renewable resources (wind/ solar) Geothermal can be considered a 100% renewable primary energy source. Using the earth’s ability to store vast amounts of energy from the sun. We can essentially use the energy found literally right in our own back yards as a primary heat source to heat and cool our homes. Geothermal technology is based on the fact that the earth, beneath the frost line, remains at a relatively constant temperature throughout the year. Warmer than the outside air during winter, and cooler during summer. Closed Loop: High-density polyethylene pipes are buried deep into the yard and filled with a solution of antifreeze and water. This liquid absorbs heat from the earth and delivers it to a heat pump in your home. The ground loop system can be in a vertical or horizontal configuration. If a stream or lake is near by the building site, loops of pipe can be put into the water to take advantage of the better thermal transfer properties of water than those of soil. This however is quite rare and seldom done. Open Loop: also very rare is the open configuration. The heat transfer is the same, as that of the closed loop but needs an aquifer to draw and deposit to. This configuration is refereed to as open because a constant source of fresh water is brought into the unit and then exhausted out the other side back into the aquifer. The pipes are obviously open on either end hence the name. The heat pump compresses the energy absorbed from the earth to temperatures that are hot enough to heat either Air for forced air heating, or water for in floor radiant heating. 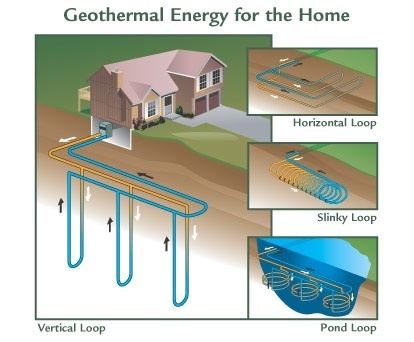 Similar to conventional systems, geothermal heating can be distributed through either a forced air duct system, radiant in-floor, or a combination of both. 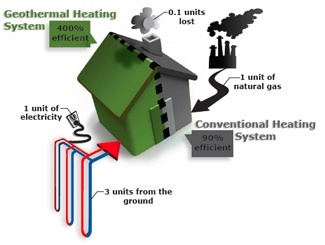 Geo-thermal units or systems are considerably more expensive than conventional (gasfired) forms of heating. A little research on the internet will lead you to believe that the payback on this type of investment is in the 5-7 year timetable. It has been my experience that the actual payback time period is more likely 10-15 years. It is my opinion that geo-thermal (for the right customer) is a very worthwhile investment, but that it comes with a price tag and some lifestyle decisions. Namely, the building as a system needs to be looked at when deciding to install one of these units. It is my opinion that these are not plug and play units. You cannot just remove a high efficient furnace unit and replace it with geo-thermal, but rather much more consideration must be given to the level of insulation in the home. The air tightness of the building envelope most become of greater importance. And lastly some lifestyle choices as to the occupant’s minimum level of comfort must also be examined. It has been my experience that to achieve an appropriate return on investment the house must be operated at a constant temperature and at one below the current (North American) standard of 20 degrees Celsius.